Speculative buying pushed sugar prices by Rs 200 per quintal at wholesale market in national capital on Friday. According to reports, supply from sugar mills remained thin amid brisk demand. Speculative buying pushed sugar prices by Rs 200 per quintal at wholesale market in national capital on Friday. According to reports, supply from sugar mills remained thin amid brisk demand. The prices in wholesale market rose as a result of stockists and bulk consumers like soft-drink and ice-cream manufacturers enlarged their sugar stocks fearing further rise in prices, said a PTI report. Slim supplies from sugar mills kept the sweetener prices up, the report added. Sugar prices have risen by Rs 100 since government cleared a bailout package to the tune of Rs 8,500 crore to clear over 40 per cent of outstanding payment sugar millers owe to sugarcane farmers. 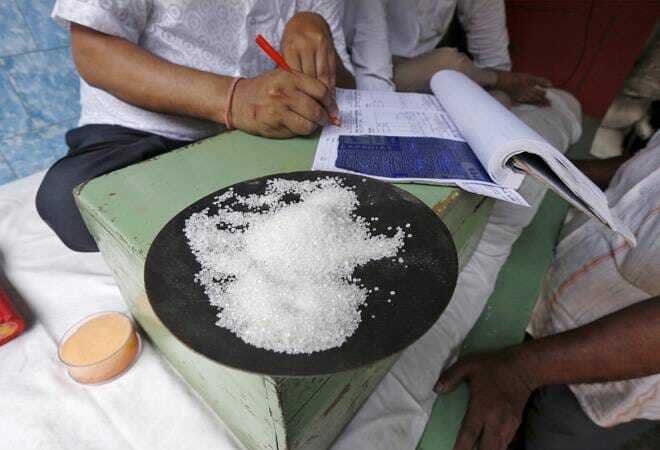 The government has also fixed the maximum support price for refined sugar at Rs 29 per kilogram to ensure that the prices do not fall further. In the price section, sugar ready M-30 and S-30 shot up by Rs 150 each to close the day at Rs 3,550-3,700 and Rs 3,540-3,690 per quintal. Similarly, mill delivery M-30 and S-30 prices climbed by Rs 160 each to settle at Rs 3,260-3,430 and Rs 3,250-3,420 per quintal. Meanwhile among mill gate section, sugar Sakoti and Khatuli soared up by Rs 200 each to end at Rs 3,300 and Rs 3,460, followed by Budhana, Thanabhavan, Modinagar, Shamli and Malakpur by Rs 190 each to Rs 3,360, Rs 3,370, Rs 3,320, Rs 3,310 and Rs 3,320 per quintal, respectively. Sugar Simbholi hardened by Rs 180 to Rs 3,280 per quintal, while Asmoli and Dorala by Rs 170 each to Rs 3,360 and Rs 3,350 per quintal. Prices of Dhanora quoted higher by Rs 160 to Rs 3,390, meanwhile, Mawana and Kinnoni rose by Rs 150 each to Rs 3,290 and Rs 3,430 per quintal. Sugar retail market prices ended up in the range of Rs 35-40 per kg, as per the PTI report.